Easter Sunday is almost here, and whether you are hosting family or friends or attending a gathering at someone else’s place, there are certain rules of etiquette you need to keep in mind. Children: The invitation must clearly indicate whether children are invited. Holidays such as Easter and Passover naturally include the children of family and friends. 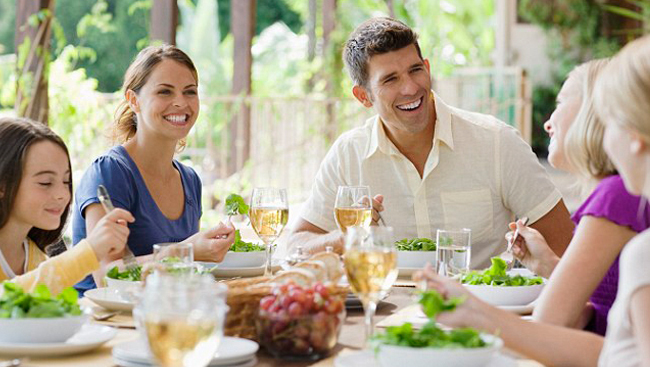 If the kids are not invited, host an evening event rather than a brunch so your guests have time to hire a babysitter. When you receive an email from a parent requesting a favour because he can’t find a sitter, respond that you understand and will miss him; it is inappropriate for you to allow his daughter to attend, without making an exception for all of the other children. You must be fair and be consistent. Setting a beautiful and proper table: A place setting is a global compass for your dining experience. It is important to understand how to navigate the system, whether simple or multiple courses, and understand the proper placement of the plates, stemware and utensils. Set the table the day before the dinner. With the exception of the cocktail and dessert forks, most forks are set on the left side of the plate. The cocktail fork may be placed on the right side in a soup spoon, or brought out with the cocktail. The dessert fork is placed above the plate. The bread plate and butter spreader are placed on the left of the dinner plate. The stemware is placed on the right of the dinner plate. Place the napkin in a creative way. Hostess gifts & a handwritten thank you note: A thoughtful guest arrives with a small hostess gift such as tea towels, scented candles or a diffuser. If gifting flowers, have them delivered in advance. Sending a personally handwritten thank you note within 48 hours is a beautiful expression of gratitude. Kids of all ages, and even adults, were seen jumping, clapping, waving and singing along the entire show. The coins are offered in both 24 karat gold and pure silver and are of the highest industry standard purity. This event will bring together over 350 students, South Asian veterans, including WW2 veterans, veterans families and members of the community in a unique commemoration ceremony. When gardening, few key considerations are wearing the right gear. The 11th anniversary of the BC Shellfish and Seafood Festival will be held June 9 ‐ 18, 2017 in the Comox Valley during BC Seafood Month. The Alliance of BC Students (ABCS) has launched its “Count On Our Vote” campaign in advance of the upcoming provincial election.